If you’re interested in having gutter guards installed on your home in Des Moines, Iowa, or any other nearby area, turn to Waddle Exteriors. We install the Gutter Topper gutter protection system, which is the No. 1 consumer-rated gutter cover available on the market. These gutter guards will keep leaves and other debris out of your gutters and will ensure that you don’t have to risk your own safety to clean the gutters on your home. And, by choosing Waddle Exteriors, you’ll benefit from our unparalleled customer service. We’ll work closely with you by providing a complimentary consultation, in which we will assess your home’s needs, inform you about the exceptional products we provide, guide you toward making the best choice for your home, and offer a no-pressure quote for your project. In addition to their high performance and durability, our gutter guards can also enhance the curb appeal of your home. 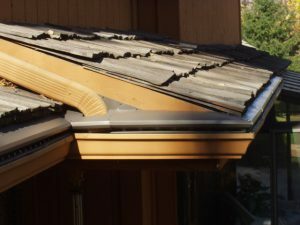 Available in an extensive selection of colors and finishes, you’ll be sure to find gutter covers that complement your home’s aesthetics. When it comes time for the installation of your gutter guards, our factory-trained and -certified craftsmen will treat your home with respect and complete the project in an efficient manner. Plus, to protect the investment you make in your home, we honor the lifetime manufacturer’s warranty provided by Gutter Topper and also offer a 100 percent satisfaction guarantee on the labor we provide. For more information about the gutter guards we can install on your home Des Moines, IA, or any other nearby community, please contact Waddle Exteriors today.